On the 27th of August, DC Mayor Muriel Bowser had the nerve to show up in Ward 8 and propose more police and more searches and house raids as the answer to rising crine. 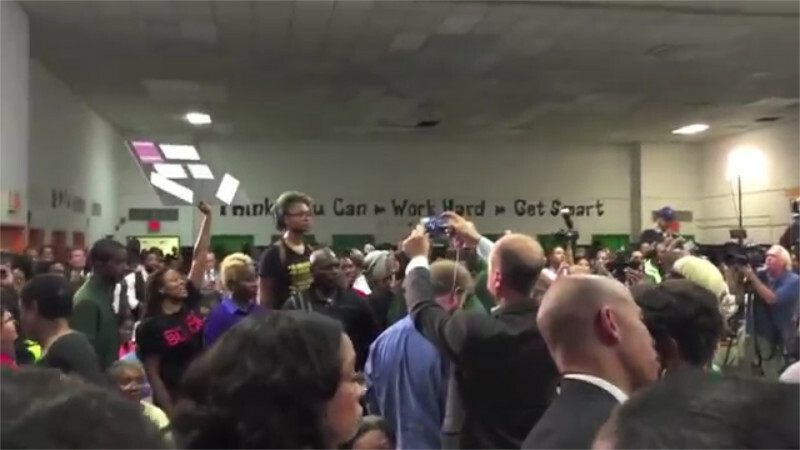 Black Lives Matter activists shouted down her denials that this would be "Stop and Frisk" in DC. She had to leave the stage under a chorus of boos as the audience resoundingly rejected her proposal for more cops, searches, and raids. 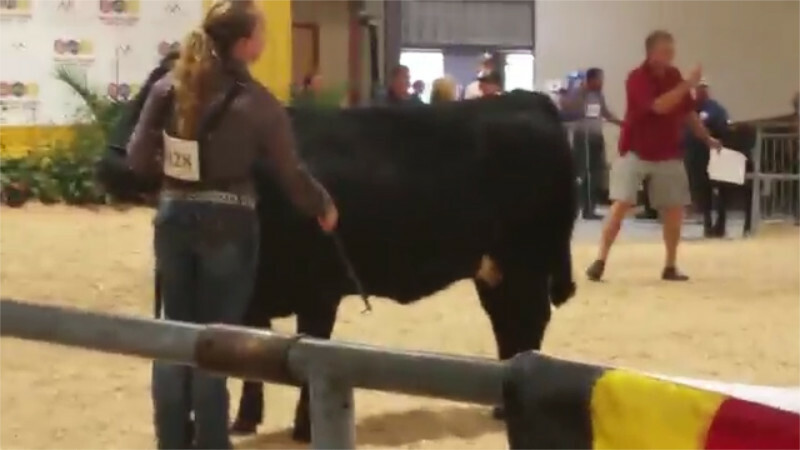 On the 31st of August, Direct Action Everywhere activists disrupted the Maryland State Fair where children are brainwashed into objectifying other animals to enable the exploiters to continue profiting from the animal slaughter. Row after row of animals were kept in pens as humans walked by gawking at them. Children aggressively led or rode animals around rings hoping to win ribbons. Animals who resisted, with eyes wide with fear, were forcefully controlled. On the 30th of August, Code Pink stages a picnic for peace with Iran and the nuclear deal that Obama has signed but some in Congress are attempting to block. US Park Police and park rangers interfered, demanding that food be served only on the curb, that not even cushions be set on the stone chairs at the chess tables, and that a woman in a chair with health issues either leave or not use the chair, Also, a very interesting dialog resulted with an Iranian resistance group that showed up to protest executions in their country. Code Pink allowed them onstage to speak and agreed with them that capitol punishment is unacceptable anywhere. 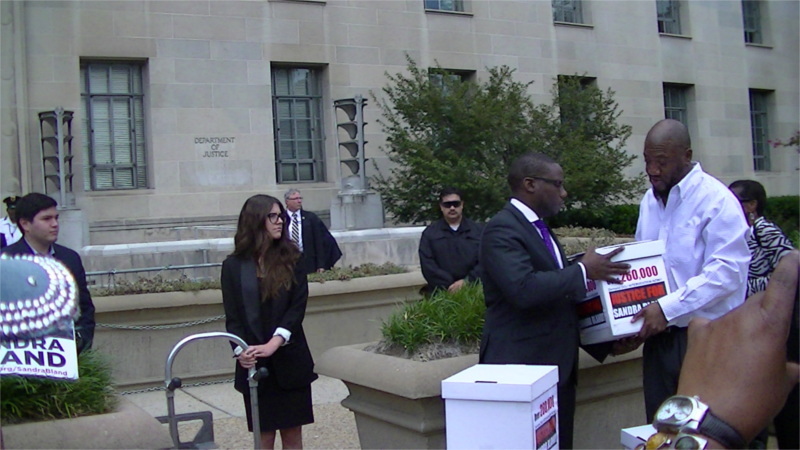 On the 26th of August, activists delivered twelve boxes of signed petitions to the Dept of Justice demanding they take over investigation of the death in custody of Sandra Bland. Waller County, Texas officials are trying to sell their claim that her death was a suicide. On the other hand, it is a certainty that Sandra would still be alive if she had not been pulled over. Additionally, most lynchings of African-Americans have been by hanging, and Waller County has a documented history of racial discrimination. 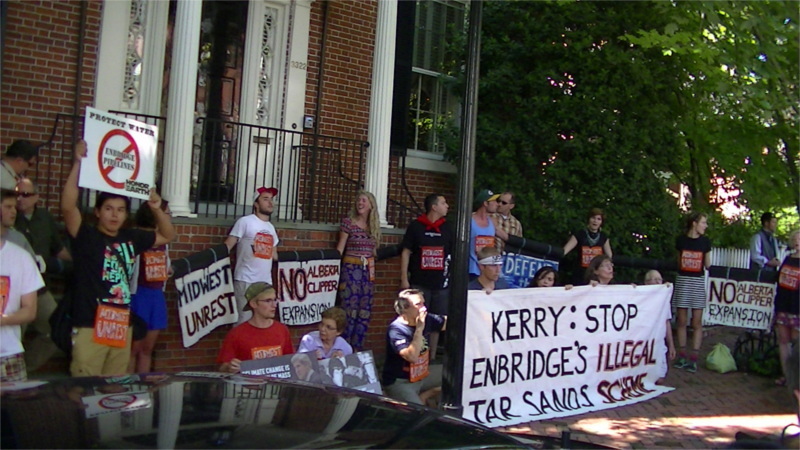 On the 25th of August, MidWest Unrest marched on the home of Seceretary of State John Kerry. Upon arrival a wave of protesters went over the police pens protecting the house and locked down in a hard blockade. It was 5 hours before police managed to arrest the blockaders. A year ago, Kerry's State dept illegally approved border bypass scheme to increase capacity of the Alberta Clipper tar sands pipeline without public input. 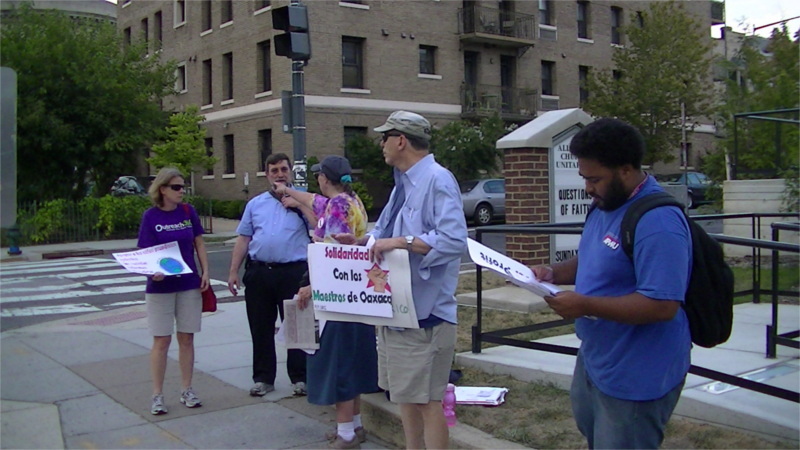 On the 24th of August, some DC area activists staged a public outreach event on 16th st about a block from the Mexican Consulate in solidarity with striking teachers in Oaxaca. Gabino Cue, governor of Oaxaca, has created a new governing body to take control of the schools anbd break the back of CNTE, one of the most militant unions in the world. This is like the Fenty/Rhee school system takeover-except that there are fears that the massive protests it has inspired by again be attacked by the Mexican army. The military has repeatedly been deployed against striking teachers in Oaxaca in the past. Back in 2006, Indymedia photographer Brad Will was shot and killed by "security" forces during a protest supporting striking teachers in Oaxaca. On the 19th of August, FOX News began their broadcast with over ten minutes of crime news, then ran a poll asking viewers if they though police street level vice squads should be reinstated. When pressed by Black Lives Matter activist over admitting that police jump-out squads exist, Police Chief Cathy Lanier blamed all jump-outs on street level vice units hunting individual drug users and small-time dealers. Previously she had denied the existance of jumpouts altogether. Now FOX News is blaming here decision to eliminate the police units blamed for terrorizing whole blocks for the rise in crime. There was at least 70-80% as much crime last year, you'd think from watching FOX that there was ten times as much this year. The 18th of August was a regional day of protest against Dominion's planned Atlantic Coast fracked gas pipeline. Friends of Nelson County called for solidarity actions in communities along the route or otherwise effected by Dominion's fracked gas projects. 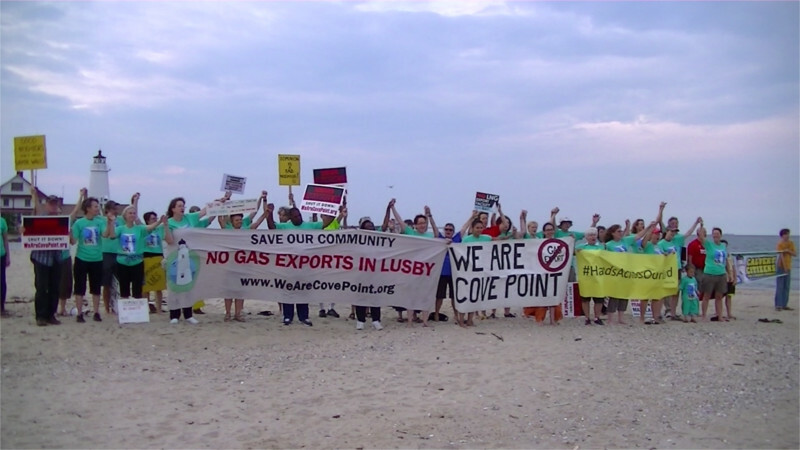 One of these projects is the conversion of the old Cove Point LNG(liquified natural gas) import terminal to a greatly enlarged export terminal.Thus, one of the protests was held by We Are Cove Point on the beach by Cove Point lighthouse, with the old gas dock in the backdrop behind local homeowners and their allies from around the area. 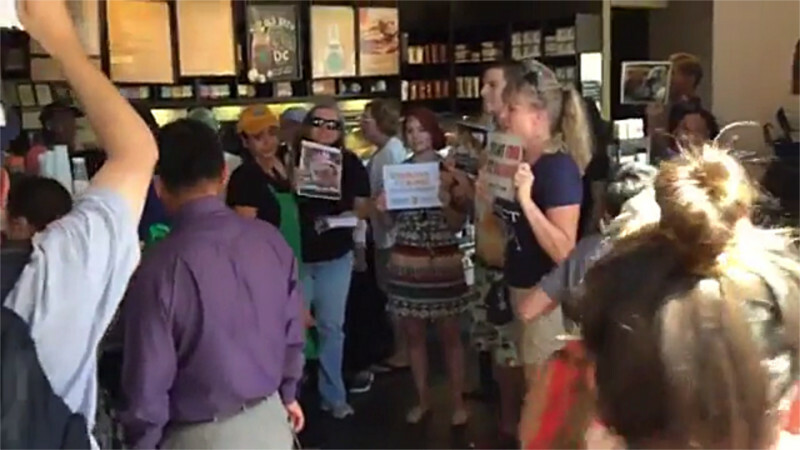 On the 15th of August, vegan protesters from Direct Action Everywhere (DXE) protested inside first a Starbucks and then a Whole Foods in Baltimore. In both cases the issue was the sale of animal products. At Whole Foods extra attention was paid to the fake "cruelty-free" marketing Whole Foods is known for.